This story has been updated to reflect developments after Wednesday night’s Balmorhea I.S.D. board of trustees meeting. 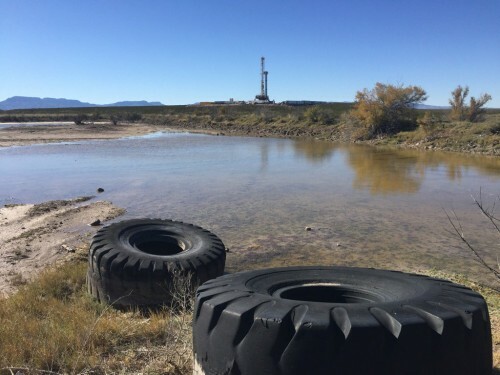 At a meeting Wednesday evening, the Balmorhea Independent School District’s board of trustees was set to consider the possibility of leasing some of the district’s mineral interests to the oil and gas company Apache Corporation. But school board member Sandra Navarrete said late Wednesday night that Apache representatives pulled out of the meeting. “We’ll try this again,” Navarette said. Apache Spokesperson Castlen Kennedy noted that the representatives that were planning to be at the meeting were independent land brokers working to secure a lease agreement with the district. Navarrete – who also works for the City of Balmorhea – said the board was recently approached by District Superintendent Manuel Espino about the possibility of signing onto a lease agreement, but that the board wanted additional information before moving forward. Even in the wake of brutally low oil prices, it appears that Apache is exploring the possibilities for future prospects in the area. Texas Railroad Commission records show the company had 17 new drilling permits approved across the Permian Basin in March, with three permits in Reeves County approved on Wednesday. That forward-looking mentality would make sense with news that oil prices might have bottomed out thanks to finally-dropping oil production. “Even if one gets to that point, the acreage may never be drilled on and could just be used for pooling purposes,” she added. Still, the idea of an increased industry presence in this small town on the edges of the region’s once-booming oilfields does make some people nervous. Navarrete said she has mixed feelings over the district signing a lease with an oil company. She worries about the effects of industry in the area, but acknowledged her rural school district could use the extra revenue. “We’re put in a hard position,” she said, noting that any decision she encourages the board to make could have blowback. 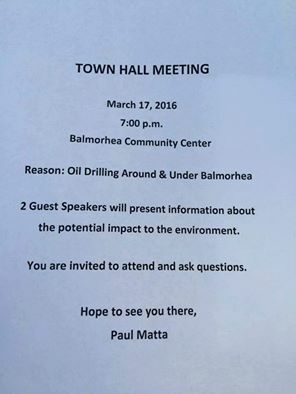 A flyer distributed to Balmorhea residents about Thursday’s community meeting. Another school board member, Paul Matta, has organized a community meeting on Thursday to discuss the broader prospects of further drilling in Balmorhea as a whole. Matta and Navarrete both said residents have recently reported being approached by oil company landmen offering mineral rights agreements. “[City Hall has] been screening calls since day one because everybody’s been approached,” she said, noting that she was also approached herself. Matta said the speakers include a nun from San Antonio who he described as “very knowledgable about the oil industry,” and a Dallas-based chemist and scientist who has performed environmental baseline testing at prospective drilling sites in the past. 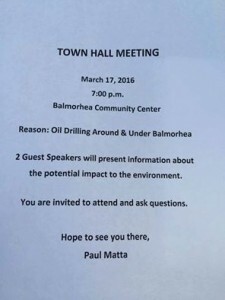 While he is not in favor of further drilling in Balmorhea, Matta said he wants the meeting to be primarily informative. “I just want people to understand what they’re getting into [before signing a lease], I want ’em to pause and think about potential consequences,” he said. 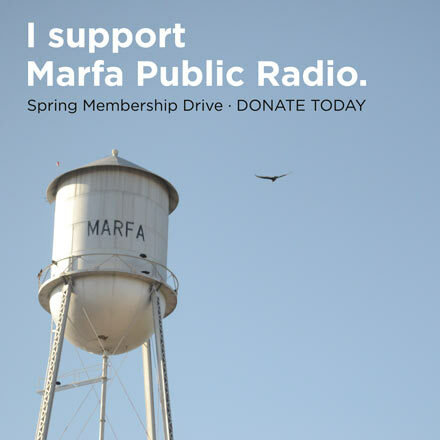 Navarrete said she hoped the school board’s Wednesday meeting would give the board a fuller picture of Apache’s interest in the district’s mineral rights: what processes would be involved and what the impacts could be. As to Apache’s broader plans for the area, the company has said previously it doesn’t typically disclose specific well plans or details “until there is something to share,” and generally would only do so in a corporate presentation or earnings update. This entry was posted in KRTS News and tagged Apache Corporation, balmorhea, Balmorhea ISD, Economics, Energy, Industry, Oil and Gas. Bookmark the permalink.